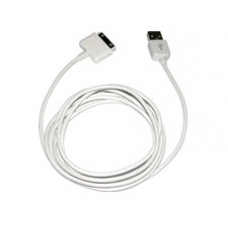 High quality 6ft USB cable for the iPod Touch 4th Generation allows ultimate convenience when syncing or charging your iPod. This extra long cable reaches further than the standard supplied cable. This iPod Touch 4th Gen sync and charge cable is used to upload MP3s and other supported files to your iPod and is fully compatible with PC and Mac. * High Speed USB 2.0 Cable . * Handy 6 Feet in Length Lead.